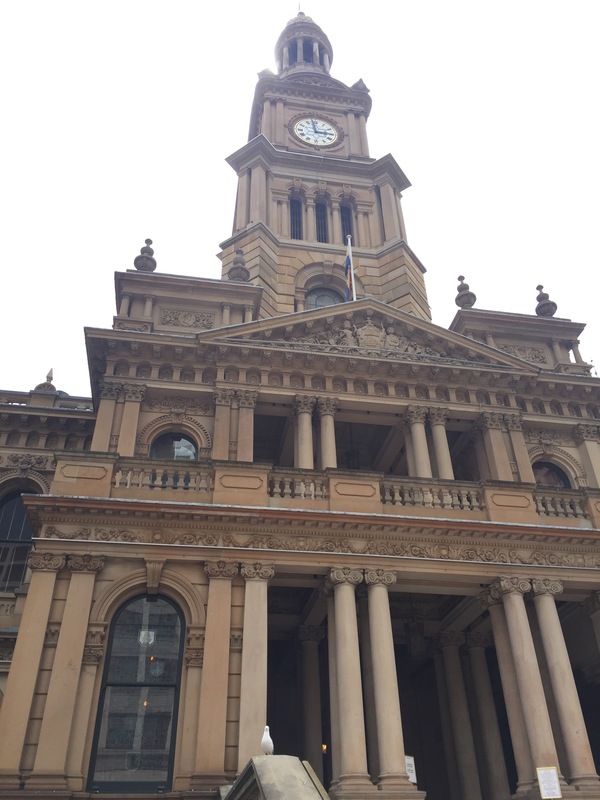 We left our air b’n’b place a day after Sophie flew home (4th January 2017) and moved into a hostel called Base which is near to Darling Harbour and the Town Hall. Niall had got some work through an organisation called Event Workforce and had confirmed shifts until the 11th so we were staying in Sydney for a bit longer. After checking in we had a bit of a wander and got to see the Town Hall properly – it’s a very grand building and surrounded by high end shops so is a nice area for the hostel to be in. Hyde Park (mentioned in my last Sydney post) was also really near by so we exploited the nice weather and had a better look around. It’s a really nice park – really big – and has a memorial for King George which was very pretty. There is also a very nice Anzac war memorial in Hyde Park which overlooks a ‘pool of reflection’. 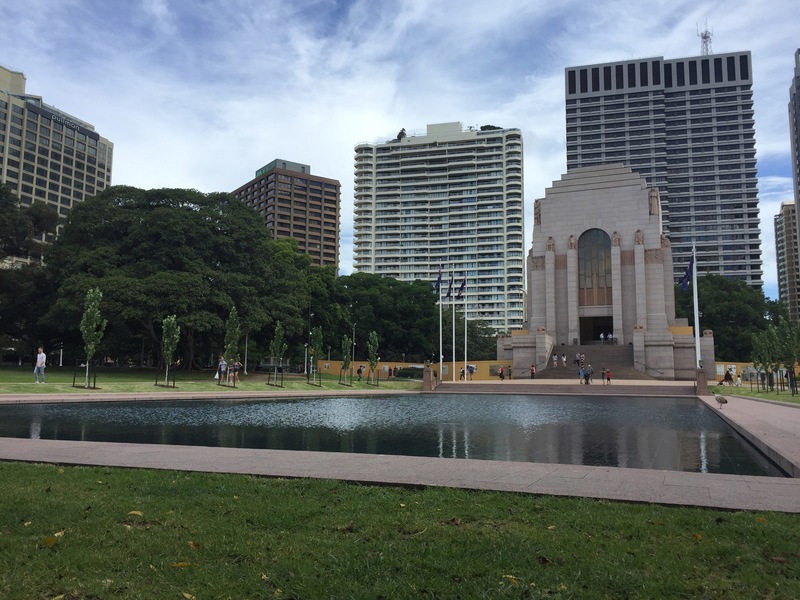 The view was really peaceful – Australia knows how to do a good war memorial! There is also statues of giant bullets and shell casings which are to represent the soldiers fallen and those that came home and the memorial itself was made by the unemployed soldiers in an attempt to get them into work. This is the perfect park to just come, sit and relax. We then spent the rest of the evening in our hostel. The hostel is attached to a bar which has a good happy hour and we’re on the 4th floor so don’t get any of the noise from it at night which is ideal. The night we arrived they made free sausage sandwiches for tea (Niall had mine) and goon (a cheap box wine) which was good. People had a drinking game competition (flip cup where you race to down the drink and then flip the cup upside down) which had a prize of a $50 bar tab and then we all went to the bar and got a free drink and played beer pong. Me and Niall got into the second round and only just lost – I was surprised I managed to get any in to be honest! It was raining for a lot of the next day so we had a slow start to the day. Our hostel is pretty good for giving free food and was giving out free pizza today which (obviously) we jumped at! In the afternoon the weather cleared up and so we went for a walk around Darling Harbour. It’s a really nice harbour and had more to offer that we hadn’t seen yet which I hadn’t realised at the time. The sun came out and we had a lovely afternoon together including playing some games of chess on a fake lawn by the water (Niall won both times damn it and we had a small audience for both the games which was a surprise and slightly distracting)! Darling harbour is also where the maritime museum is so there are loads of old ships, submarines and war ships around which is cool. The tall ships were my favourite because they’re just like a pirate would have and I love the contrast to the modern buildings around it. There was also a ‘welcome wall’ which has names of the first migrants to Australian and extracts of what they thought when they first arrived. I love hearing stories from what it was like in the past; we both find it really interesting. It was interesting to see that some found it too hot, that some were disappointed (e.g. it had been portrayed as a place to find gold when that wasn’t really true) or that they just loved their new life – some hadn’t had the choice of whether they would even be going – seeing as lots of convicts where sent here – which is a crazy thought. Its hard to imagine going to a country where you may know little to nothing about it and have no idea what it’ll look like when we live in a world of lonely planet guides, trip advisor and google images. Darling Harbour is really pretty and full of restaurants and bars (some good happy hours if you’re visiting) and I think it’ll be somewhere I return to quite a bit before we leave Sydney – it’s great having it so close to our hostel! Something that we had been looking forward to a lot since starting our trip was seeing Catfish and the Bottlemen. Niall hadn’t ever had a chance to see them before and so we had made sure to get some tickets to come see them while they toured Aus. On Friday 6th January 2017 we headed to the Enmore Theatre with an awful lot of other people for the gig. We were able to have some drinks (thank you Biz and Rowan for the Christmas dollars that paid for this) and had a really good night – they were really good! The next day we got the ferry to Manly which takes around 15 minutes from Circular Quay (the main harbour). It was lovely weather and Manly is really pretty. When we arrived there was a coke van giving out free coke including a one called a Spider which is coke with ice cream so that was a good start to our day. The coastline looked amazing with super blue seas and we spent hours walking along the coastal walks, going to the different beaches and relaxing in the sun. It was a really lovely day and we were able to watch the sunset from our ferry back to the CBD. Niall’s work meant he was working for the rest of our time in Sydney between 4pm and 8:30pm at an open air cinema on the harbour. He was working for a bank called St George and was allocating seats to St George customers, handing out cushions and generally assisting in whatever was needed. He’s enjoyed working there and even got food at the end of each of his shifts! The films being shown are either ones currently in the cinema such as La La Land and The Accountant or preview films like Collateral Beauty. The screen is in the water and the rises just as the film is about to start and has a back drop of the Sydney Harbour lit up – a pretty cool place to watch a movie. The Cinema has been going on every summer for around 20 years. Luckily, we have made some nice friends in Sydney so I haven’t been bored while Niall was at work. One of the days Niall was at work I went to Coogee Beach which is a smaller beach to Bondi but still just as busy but with calmer waters so its easier to swim about a bit over jumping the waves. We haven’t really done too much else since Niall has been working. We did get back to Mrs Macquarie’s Point (where we spent New Year) which was nice to see when it didn’t have thousands of people there with us. There are truly great views of the opera house and bridge so I recommend it if you ever come to Sydney. We have met some lovely people in Sydney and – after our trip to Tasmania – we will be back with them for a bit longer whilst we do the last things we have left in Sydney. We went on a night out to a place called Side Bar with them all which was super fun – although goon definitely doesn’t make you feel great in the morning! We have been really enjoying our time in Sydney and think it’s a great city. A lot of people had told us we would either like Melbourne or Sydney and apparently that’s really common but we have loved them both in such different ways. We are coming back to Sydney for a week to enjoy Australia Day and see the Blue Mountains and last bits of Sydney beaches before heading up the East Coast but, first, we are off to Tasmania! Previous New Years Eve – Hello 2017!